As painful as leaving the new house was I enjoyed my beach vacation a lot. My new garden survived though I've been fighting to regain control of the weeds that took advantage of my absence. The growth while I was gone has had me busy freezing and drying herbs and vegetables but I couldn't skip the Daring Baker challenge! I had a chance to make this months challenge just shortly after we got back from the vacation when we had some new friends over for dinner. However I had a new twist thrown into to my typical dairy-free adaption because one of the guests doesn't eat soy. Out went ol' standby Earth Balance... (We can't use the soy-free EB because of the pea protein in it.) After a little grumbling and worrying, a kind soul on the Daring Baker forums mentioned Ricki of Diet, Dessert and Dogs. I purchased her book Sweet Freedom earlier this summer but hadn't had a chance to do more than light skimming. A quick look brought me to her Chocolate Buttercream Frosting, a coconut oil based frosting sweetened with agave nectar. With some soy-free almond milk the recipe was safe for both my little dairy avoidee and the soy-free guest. Well, I loved the frosting and so did my son Alex! It was just sweet enough and very chocolaty. I thought this torte was a good pick since it's been awhile since the Daring Bakers have made a fussy cake. The thin sponge layers were something I've never made and the caramel coated layer was fun to make and pretty. Sadly, the summer humidity made the caram el very chewy by the time I served. Also, I really didn't get why the caramel had all that lemon juice in it. Caramel shouldn't be tangy! Still, it looked nice. Thanks to the Daring Bakers I've tried something new and enjoyed myself baking. 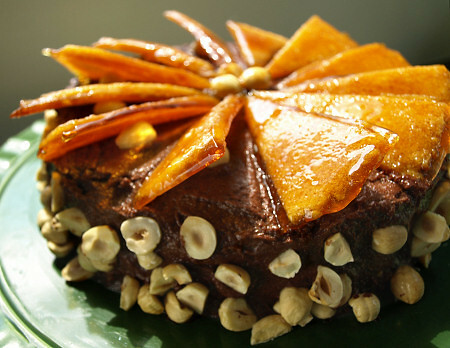 -Visit our hosts, Lorraine of Not Quite Nigella and Angela of A Spoonful of Sugar for copies of the recipes to make your own Dobos Torte. -If you'd like to join in on the fun visit the Daring Kitchen. There you can also check out all the participants by browsing the Daring Baker Blogroll. -To get the recipe for the agave-sweetened chocolate butter cream get yourself a copy of Sweet Freedom by Ricki Heller. Since I cracked it open for the buttercream recipe I've also started regularly making her Lemon-Blueberry Scones. I can't even begin to tell you what a hit they are and it's a perfect recipe for the Michigan blueberries in season now! Ricki also has an online collection of recipes to try at the DDD recipe index. 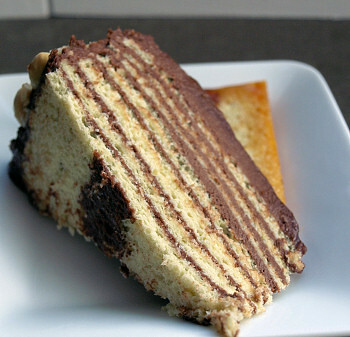 -You can find more European sweets, including the original recipe for the Dobos Torte in Kaffeehaus: Exquisite Desserts from the Classic Cafés of Vienna, Budapest, and Prague by Rick Rodgers. 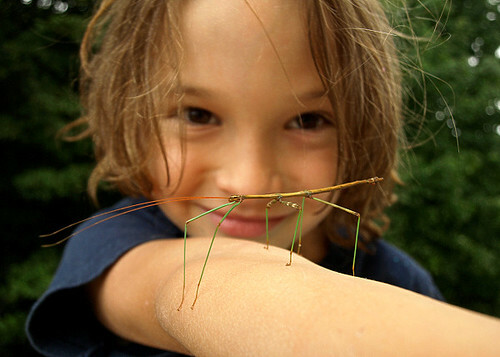 My son Alex and a walking stick bug we found on the house.